As Kiki gets older, now almost 1.5 years old, I take less photographs of her, even though I wish I had taken even more when she was a small puppy. I think in my mind I always thought she would shrink back to under 20 pounds, only to expand again to her current 62 pounds. Apparently, this is not going to happen. She loves the beach and loves to swim. She likes to chase me while I skimboard too. After coming out of the water she will often do a nosedive right into the sand. This is of course nonsensical to me and alarming, as I do not want her to scratch or irritate her eyes by driving sand into them. The only thing that is not concerning about her sand faceplants is the comical covering of sand on her head that results. She is nonplussed about it. 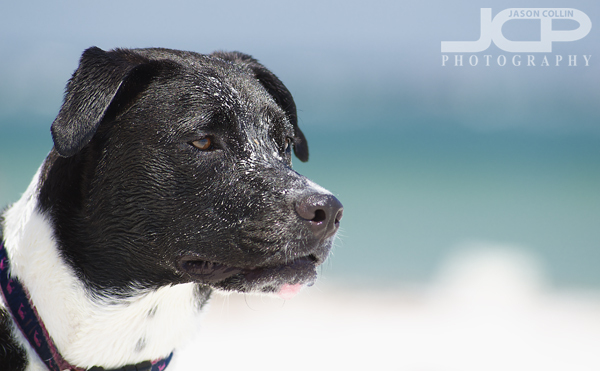 Nikon D300 Nikkor AF ED 80-200mm f/2.8D @ f/4 ISO 200 1/2500th (all 3 same)I also feel Kiki shakes much more than other dogs. Many times a day she shakes for no apparent reason inside our sand free home. Of course at the beach she shakes every other minute. What kinds of unusual things does your dog do?